At the beginning of a Kids in the Kitchen field trip, Vanessa Moessner tells 30 to 110 fourth-grade students that it takes seven tries for a person to know if they like a food. If a student says they don’t like something on the menu, all they have to do is name seven dates and times they’ve tried it, and they’re off the hook for an additional taste-test. Very few children leave without having eaten all sorts of new fruits, veggies, and dishes. 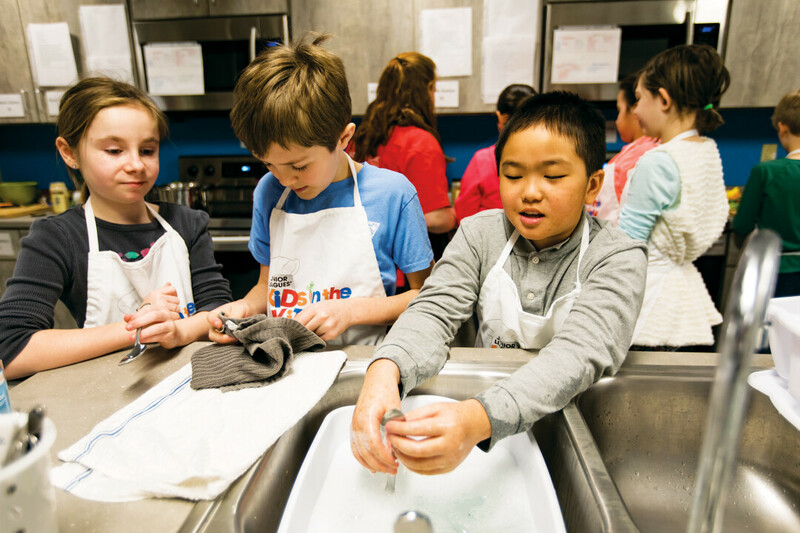 Kids in the Kitchen is a free field trip for Eau Claire Area School District fourth-grade classes in which students learn about healthy eating and living at the Boys and Girls Club of the Greater Chippewa Valley. The Junior League of Eau Claire established the program in 2013, partnering with Mayo Clinic Health System to expand offerings to more and more schools over the years. During the 2017-18 school year, the program reached the milestone of providing the field trip for all 13 fourth-grade classes in the school district. It was also during the recently completed school year that the Junior League began transferring the program to Lily Pad Lab, Moessner’s early and home education business. Moessner will take on full control of Kids in the Kitchen for the 2018-19 school year. Each field trip is divided into three parts. The children are split into groups that take turns learning how to clean and chop fresh vegetables and fruits, sweating it out with a Zumba session, and cooking vegetarian chili at culinary stations. Volunteers help teach students proper cleaning techniques and safe knife skills at the chopping station. Moessner instructs them to use the “bear claw” method, curling their fingers in the shape of a bear claw to reduce the risk of cutting fingertips. Everyone uses plastic lettuce knives, which can slice through greens handily but are foiled by flesh. 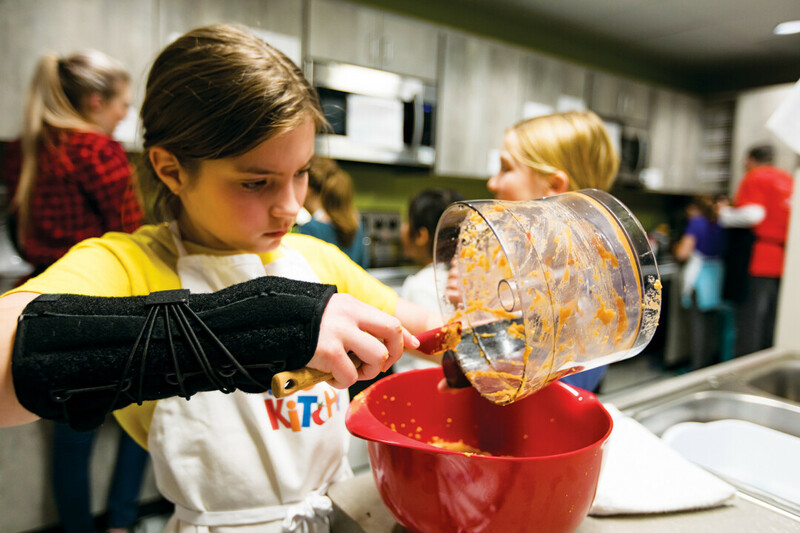 At the culinary stations, kids learn how to cook vegetable chili and prepare red pepper hummus. Volunteers introduce them to the use of a food processor, teach stovetop safety, and extol the importance of kitchen cleanliness. The kids have a blast sucking on limes and reading recipes, Moessner said. Of course, a healthy diet ideally comes hand-in-hand with a healthy lifestyle. So students spend part of the field trip exercising with Zumba, taught by a volunteer instructor. After all the groups have tried each activity, students, teachers, and volunteers settle in at cafeteria tables to enjoy the fruits (and vegetables) of their labor. Following the management transfer, Mayo Clinic Health System increased its contribution to the program. However, Junior League’s exit left a need for fundraising. Moessner reached out to local businesses and community members to raise the necessary funds to provide programming for every ECASD school during the 2018-19 academic year. “These families and businesses will help us fight childhood obesity in Eau Claire for one more year and help students learn to make lifelong healthy food choices!” Moessner said. Kids in the Kitchen will continue to accept donations throughout the school year. For every additional $1,000 raised, they will be able to serve an additional area school outside of ECASD. Another hurdle she faces is the enlisting of volunteers. Lily Pad Lab needs at least 10 volunteers for every field trip to help at the various stations. College students, stay-at-home parents, and retirees have all had a blast helping put on the program, according to Moessner. With 13 field trips scheduled for the school year, she needs quite a bit of help. “It’s really been a gift for me to get so much positive feedback about the program,” Moessner said. Kids hear about the field trip from their siblings and other kids in the school, so they know they’re in for a good time. By the end of their time in the kitchen, Moessner knows the program has made a difference. “They’re standing tall and proud because they have made themselves a lunch,” she said. You can find more information about Kids in the Kitchen including contact information for donations and volunteering, at lilypadlab.com.